Browse > Home / New Posts, Testimonials / Fiona – Up, Up, and Away! Fiona – Up, Up, and Away! Fiona is a female calico cat who shares Elaine M.’s life with Clio, a female dog. One day, through an unusual set of events, Fiona got out of Elaine’s apartment on the third and top floor of their building in Peekskill, New York. The skylight in their apartment would not close properly and had no screen. Even though Elaine thought she had shut the skylight snugly, somehow it opened again after she left for work. Fiona’s cat tree was beneath the skylight in a spot that Elaine thought was perfectly safe for her feline friend. Fiona took this opportunity to climb a little higher than usual getting onto the roof through the Skylight. To her horror, Fiona discovered that her claws had no traction on the slippery slate roof tiles. Despite her best efforts, she slid off and fell all the way to the ground. It’s been found that when cats fall a long distance, their chances of landing uninjured are actually better than when they fall a shorter distance. So I was optimistic when I began my telepathic conversation with Fiona that she had survived her fall. Elaine, Fiona, and I had a very positive conversation during our session. Fiona was mostly scared and confused, as she wanted to get back into the building the way she had exited. I persuaded Fiona that she should definitely stay on the ground and find a safe place to “hang out” until Elaine and all their friends and neighbors who were helping search for her were able to find her. I helped Elaine and Fiona make the gold cord connection and taught them both how to use it to energetically bring them back together. I explained some other techniques as well so that both Elaine and Fiona ended the session feeling very optimistic. I have great news, my baby is back home with me. I put out her kennel and cat litter as suggested, but that didn’t do the trick. While I was walking my dog Clio, she went crazy when we walked by our building’s gym, trying to get in through a missing pane. We’ve walked by the same spot several times, but she never paid any attention to it. Later that afternoon I was able to get into the gym which has been converted to an extremely messy storage facility (I’d been in there 2 previous times looking for her with no luck). But this time, I stood in the middle of this huge room, closed my eyes and pictured the golden chord between me and Fiona that you showed us. Within a minute I had this strong feeling that she was looking at me, so I opened my eyes, turned towards the direction that I felt her, and there she was laying on top of a couch that was on its side. I immediately began crying tears of joy and called my neighbors to help me. It wasn’t easy getting her as she ran off as soon as they came in, but eventually I caught her trying to run up some stairs. My baby is now safe at home, I have her locked in her kennel for her well being right now as we’re going to the vet first thing in the morning. She’s in very good spirits and has calmed down a lot since I brought her home. Just a few minutes ago she was rubbing against my hand through the cage and purring. I have my baby back now, I can finally sleep, and I couldn’t be happier. I owe it all to you and Clio for helping keep calm and focused. That same day came an update about the visit to the vet. A quick update, we just got back from the vet and groomers, she is perfectly healthy aside from a cut on her neck. When Fiona jumped out of her carrier, Clio went absolutely crazy and just wanted to play and play and play with her. My babies are back, and I’m so happy. It’s normal for a cat who has dropped 3 stories into a foreign world (like landing on another planet by mistake) where she doesn’t know where to find food or be safe or how to get home. Cats, when traumatized and/or frightened, naturally run and hide from everyone, even someone familiar. My cats, who have lived indoors with me their entire lives, will not run to me to protect them if there is a scarey anything that appears. They run and they hide, and that’s their very best survival instinct at work. Proof of this is Hattie, a feral kitty who hangs out in my yard because I feed her once each day. She’s about 13 years old and has survived on her own for over 12 years, or so she tells me. Hattie is quick and always knows the best hiding places. She says that she can hide really well and even make herself invisible if necessary. Clever girl! that will touch your heart. Scroll down to sign up for our newsletter and blog post mailings." "Rays of Healing Light" Homepage. 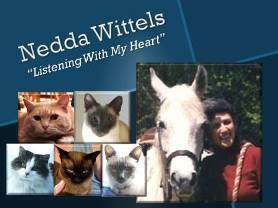 Your animals hear your voice through Nedda. They can be at the vet, at daycare, or somewhere else. Nedda helps you develop a “plan of action” for successful solutions.